If you’ve been following my Instagram stories, you’ll know that I’m currently in my favourite city in the world, Tokyo! The is my 5th time in Tokyo and 6th time in Japan overall but I still get giddy with laughter as soon as the plane lands at Narita or Haneda airport. I’ll try and do lots of posts on food and travel but something that I’ve been meaning to do each time I’m here is to do a post on all the snacks I’ve eaten here. I’m a huge snacker as any of the friends I’ve studied with or colleagues I’ve worked with can attest to. Asia in general is huge on snacks but Japan is the absolute mecca. Even just walking into a コンビニ plagues me with indecision let alone basement level supermarkets that have quite literally everything from fresh fruit, vegetables and meats, to cooked meals to snacks to things that are specifically ‘gift’ foods. So here’s a rolling list of what I have been snacking on this trip. Bought this yesterday at the basement supermarket of Tokyu at Shibuya station with the intention of saving it for breakfast this morning. The rice was really nice and springy and the cod roe was just the right amount of spice and saltiness but there wasn’t a lot of it. That was a little disappointing as I thought they’d give more filling compared to the type I get Lawsons or 7-11 but it seemed to be pretty much the same. Can’t complain considering how much I paid though! 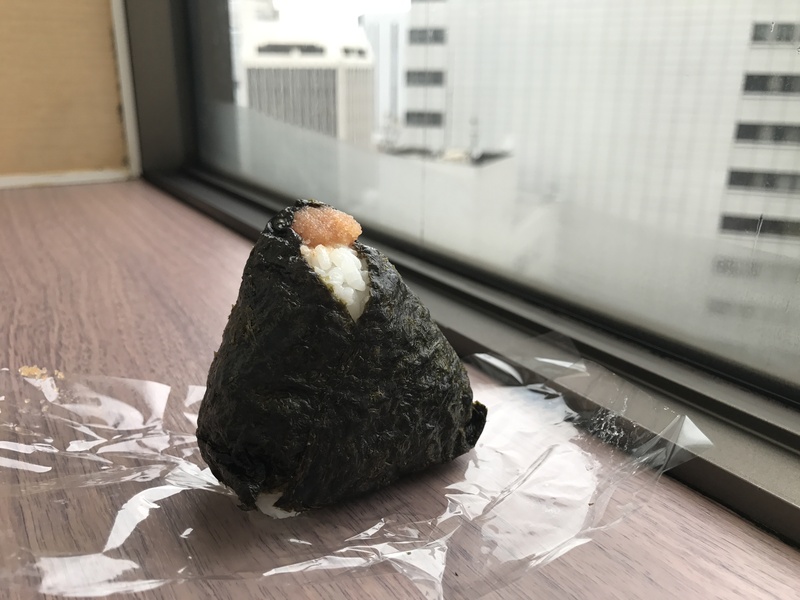 One other downside to pre-made onigiri is that the seaweed isn’t crispy. I bought this at Family Mart. I don’t usually drink juices or smoothies but this looked really interesting. It had a nice thickness to it and seemed to have the flavour of kiwi (not a vegetable) more than anything else which I liked. The packaging says that it has 9 different vegetables in it which contributes towards one of your recommended portions of vegetables. However nutrition-wise it either doesn’t really have much by way of vitamins or my barcode scanner isn’t capturing all of the information. Spent today wandering around Ginza in search of food (always) and interesting things to look at. The rain was pretty unfortunate as it made it logistically harder to get around and colder too. It’s meant to be spring and all hanami blooming but today was about 5 degrees cold and any supposed foliage looked dead. Kimuraya aka the Kimura Family bakery sits at a pretty prominent location on the main street of Ginza with its nearby neighbours being some of the most luxurious clothing brands in the world. It’s definitely a much needed reprieve though as I can certainly attest to the exhaustion of shopping. 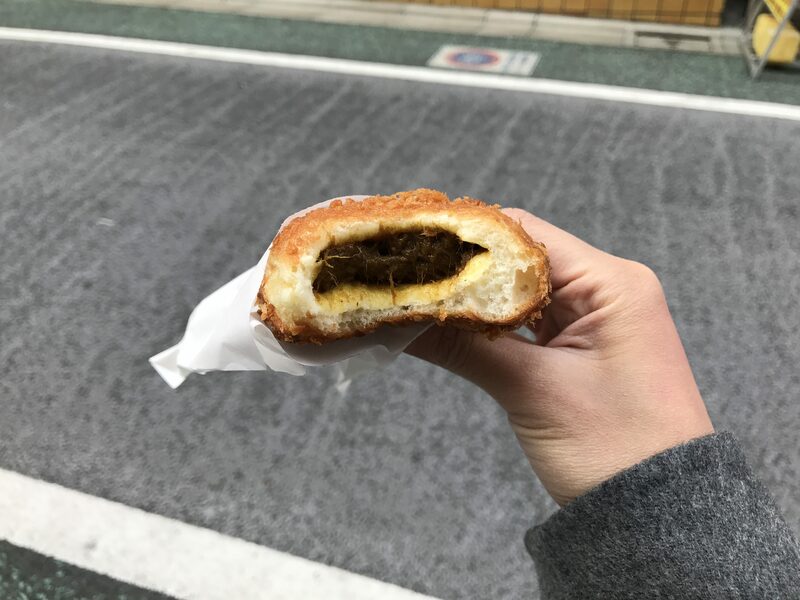 The bakery sells a mix of Western style and Japanese style baked goods but predominantly specialises in “anpan”, a traditional Japanese sweet roll that’s usually filled with red bean paste. I’ve had Kimuraya’s before but couldn’t pass up the opportunity to try their seasonal hanami offering that is the cherry blossom bean paste bread. The colour is super cute and even has flecks of green like the sakura leaves. I didn’t ask but I hazard to guess that the base is still shiro-an (made with white beans) with the theme colours mixed in. I couldn’t really taste or smell sakura but I had also just moisturised my hands with scented handcream just at that moment so it very well could be my fault. The filling didn’t turn out too sweet as I had feared, but it was actually quite nice. And I’m also a sucker for Asian style soft bread. I don’t think this bun specifically is something I would actively encourage people go to try. But it’s hard to not want to participate in the infectious joy that hanami season brings in some shape or form. I’m on Day 2 of Tokyo right now and already realising how dangerous it is to have a Family Mart conveniently located on our way back home. It means no matter how full I am, I am definitely stopping to by a snack or dessert for later or the next morning. 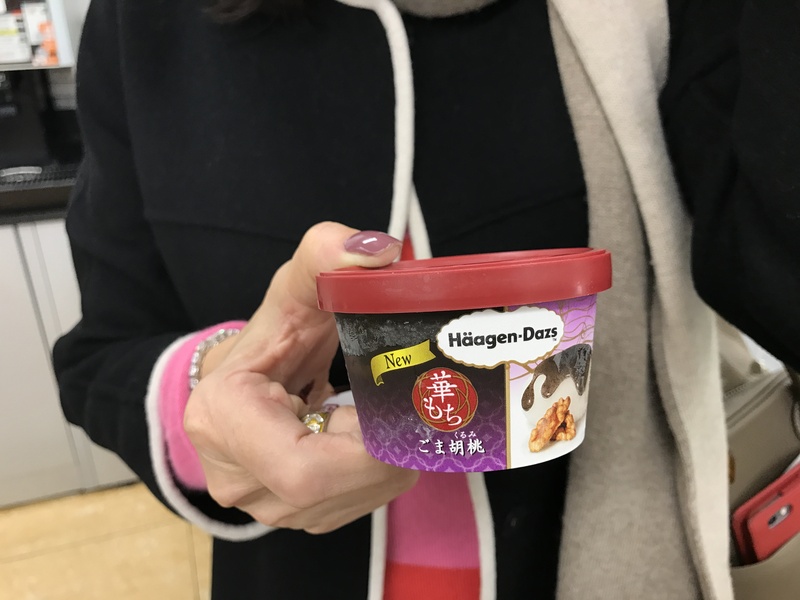 Here we have one of the new Häagen-Dazs flavours in black sesame and walnut. As the photo indicates it also has a mochi element to it. 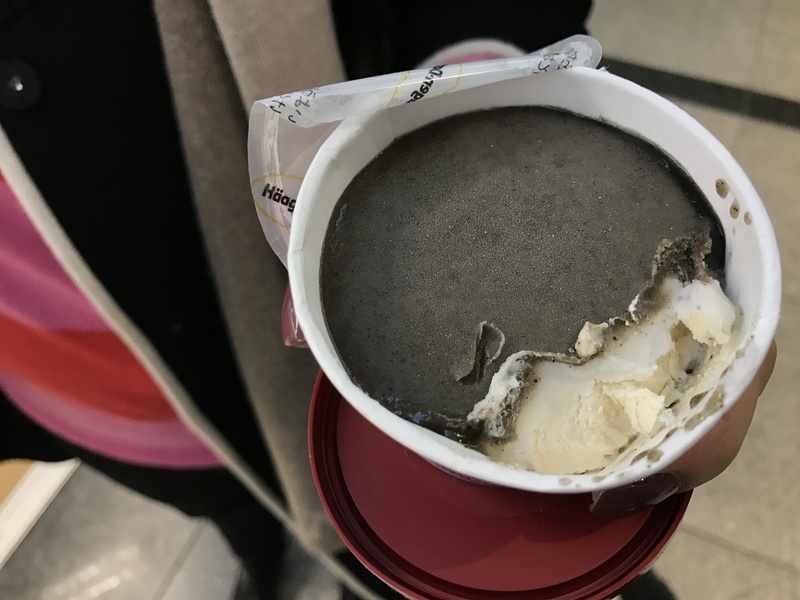 When I opened it, it looked like regular black sesame ice cream. Digging into it was a bit of an arduous task because it seemed like the ice cream was frozen solid and threatening to snap my spoon in half. Once you break through though, you realise that the reason the ice cream was so “hard” was because there is a mochi layer underneath the black sesame. And underneath that layer is vanilla ice cream with chunks of walnuts. I found the black sesame layer to be too sweet, however it was just right when paired with the mochi which was definitely all texture and not much flavour. The walnut ice cream layer was the best, creamy with lots of chunks nestling within it. So this looked interesting. I had absolutely no idea what this was meant to be besides being a “drink type” which is all I managed to read, because reading katakana makes my brain hurt.I was mildly worried that this would turn out to be some kind of witchcraft-esque drink for virility but after sitting down to read and doing some Googling, here we have a pro-biotic yogurt drink! Basically a few years ago a health trend started in Japan regarding different types of bacteria that are meant to help with your digestive system and overall wellness. 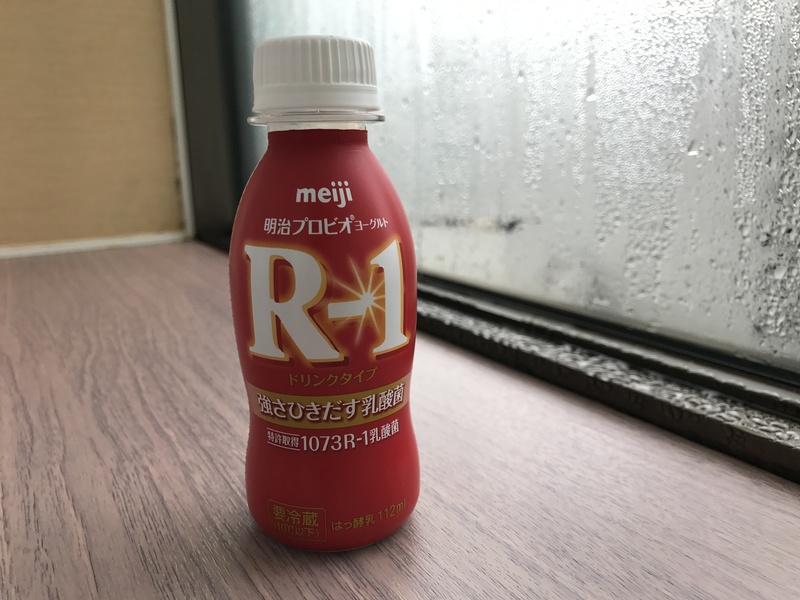 In this case, R-1 refers to 1073 R-1, a lactic acid that’s known to enhance the immune system and protect against the influenza virus. What this means exactly, I have no idea because 1) I’m not a doctor 2) I don’t understand vague pseudo-medical words. I drank this anyway and it turned out to be quite tasty, like a slightly tangier version of yakult. If it supposedly does everything that these websites online are telling me, it probably isn’t too bad an idea to be drinking these every so often while you’re on holiday. I ended up buying another variety which I’ll review shortly! More ambiguous health drinks! 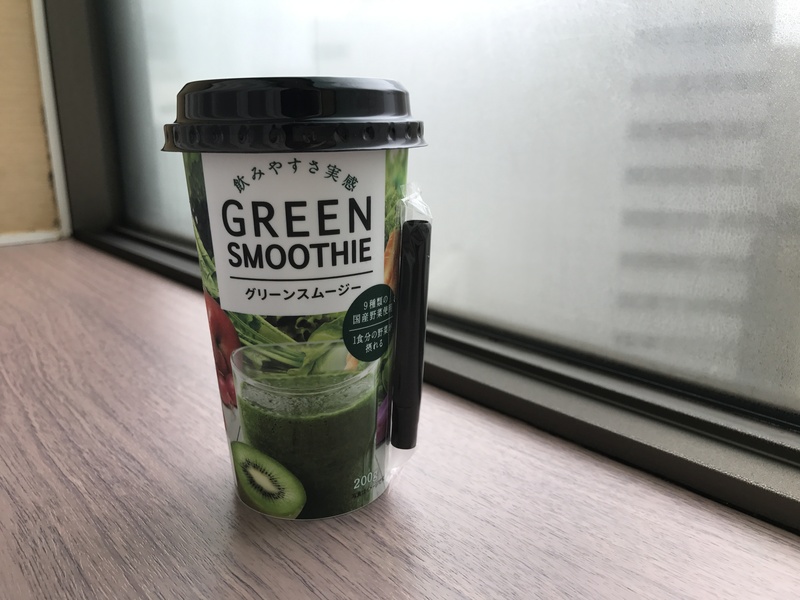 I bought this at the same time that I bought the green smoothie, the packaging really sells it to be a vegetable replacement doesn’t it? At the bottom section of the box it also lists out how much micronutrients it has like iron, Vitamin C, calcium and so forth.This one tasted a lot “healthier” than the smoothie which was definitely erring on the sweet side. It had a more distinct vegetable flavour come through, kind of like carrot and celery type juices. Obviously the very fact that these have all been bought at a convenience store, you should take it all with a (figurative) pinch of salt. But again, if you’re travelling and struggling to eat enough vegetables and maintain regularity, this might be able to help. Finally something that isn’t just from Family Mart. 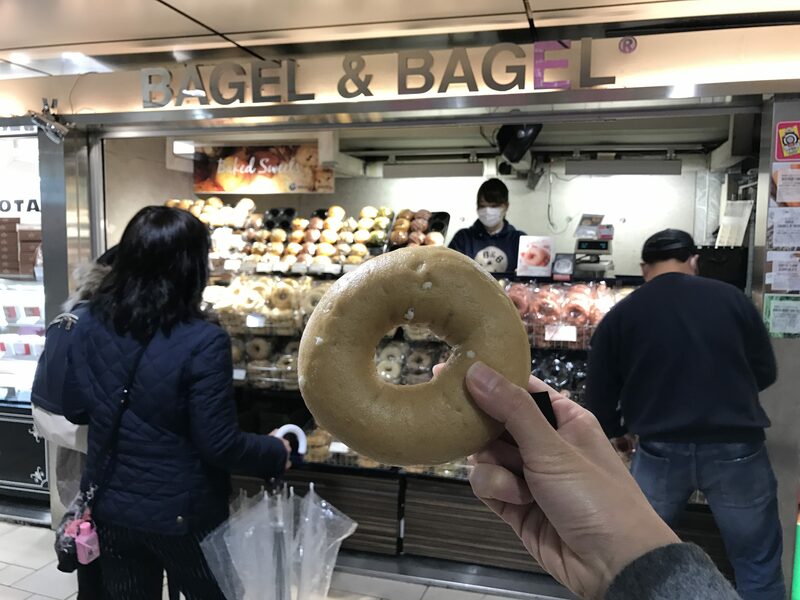 We were at Omotesando station and I couldn’t help but need to buy something from a shop that was so ostensibly called ‘BAGEL & BAGEL’. It’s pretty much a joke now because I buy bagels everywhere, even in Asia, when I know they won’t be good. I almost always send photos of it to my friend Michael who runs Brooklyn Boy Bagels in Sydney, the undisputed champion in New York style bagels down under. 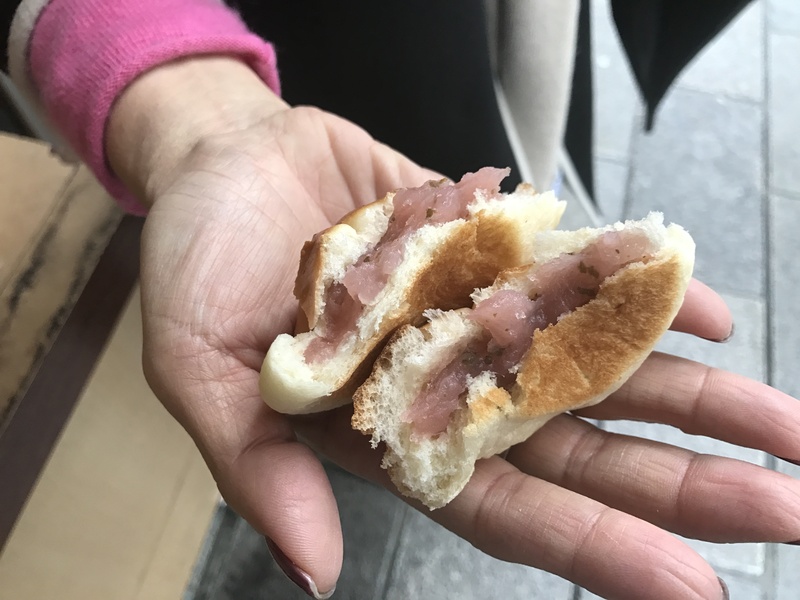 At best, some of these bagels do taste like nice “bagel-shaped” bread but you just wouldn’t call them a bagel. 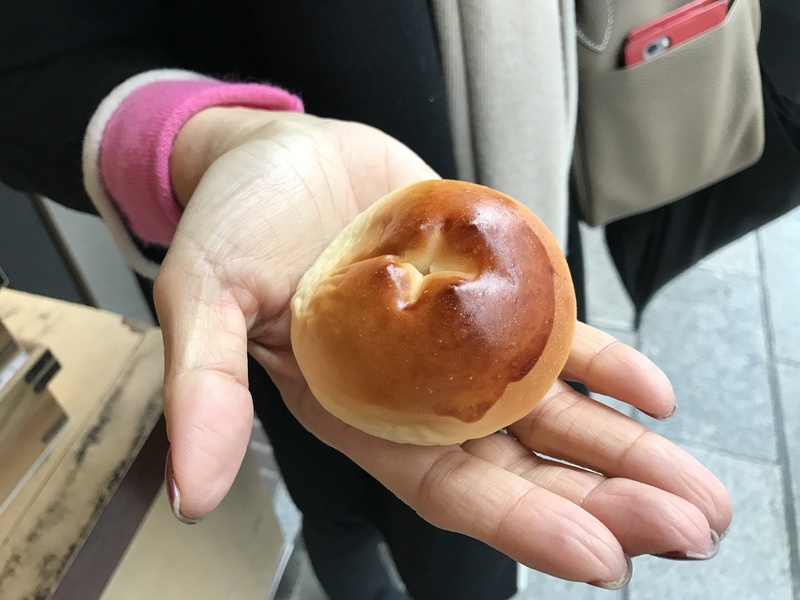 This kinako bagel follows that same pattern. I don’t even usually go for sweet tasting breads but kinako (soy bean flour) was what intrigued me. It gave it a bit of an earthy flavour, a little bit like how a soy cappuccino has that nuttiness from the soy but the deep roasted aroma from coffee. Overall it wasn’t too sweet except for the pockets of white chocolate that you’d get in some bites. First off, I can’t believe we paid over six dollars for a single KitKat finger. It’s not even a jumbo sized one, it is a single standard finger, the same as what you’d usually get except with four of them in a pack. This is the Moleson flavour, inspired by European “mendiant” flavours hence the dried fruits and nuts. The toppings are supposedly carefully hand crafted and placed on every single wafer. This differs from the now mass-produced Everyday Luxury Moleson inspired KitKat which has the same flavours except embedded in the chocolate’s surface. It was nice that we got to stumble across the new chocolatory in Ginza which just opened last month. 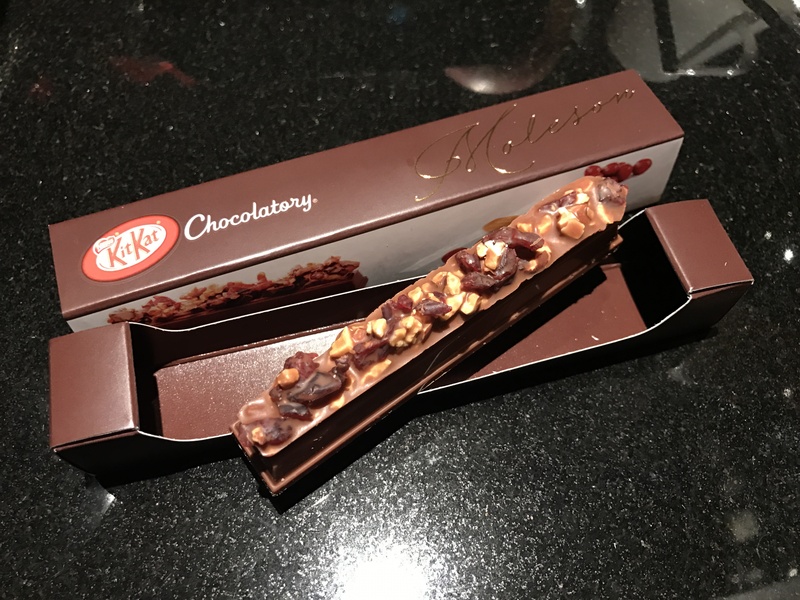 But while the Moleson does taste pretty good (fruit and nuts in chocolate have been a great pairing since time immemorial), you could probably get the same effect if you bought normal KitKat and some trail mix and just ate it all at once. However, Japan’s continued fascination with KitKats still remains so interesting to me. For the uninformed, this began with the fact that “KitKat” sounds similar to the Japanese phrase kitto katsu: ‘you will surely win’, resulting in many exam-sitting students receiving KitKat chocolate from well-wishers every year. That coupled with their penchant for giving delicious and nicely-wrapped gifts (as any visit to the Isetan basement supermarket will show you) is what makes KitKat so popular, luxurious and innovative in Japan. Let’s have more probiotic yogurt drinks! 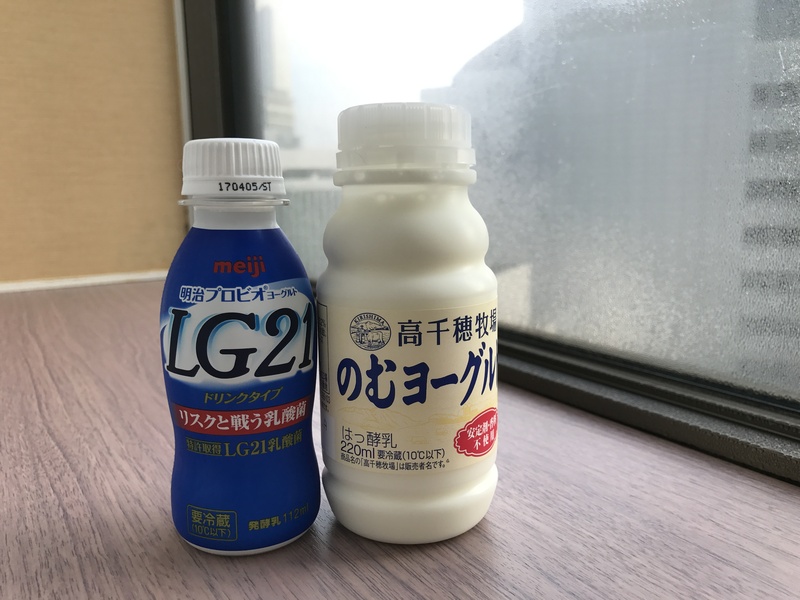 This time it’s Meiji’s LG-21 which is the shorthand of another type of bacteria (“Lactobacillus Gasseri OLL2716”) meant to combat gastric cancer. To me, it tasted just like the R-1. After purchasing this I realised I should deviate from yogurt drinks and try the actual packaged yogurt so maybe next time. This second bottle is actually a mistake. 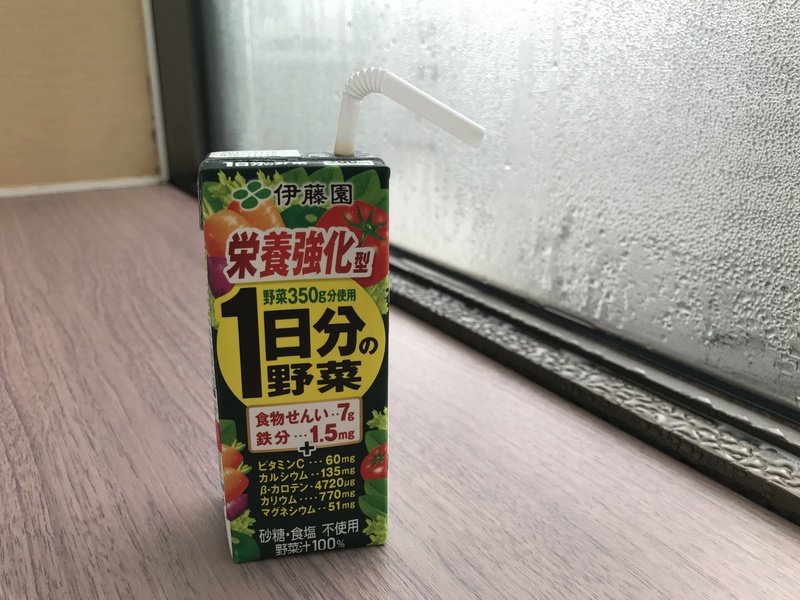 I got lazy with reading katakana again and bought it thinking it was a large bottle of milk when it turned out to be more yogurt drink, again. Again it tastes like the last two drinks except a little bit thicker. Pretty yummy! I haven’t done too many unhealthy snacks so here’s one for potato chips. You can tell by that romantic mood lightning and bed backdrop that I was eating this in bed at 10 pm at night. Only kidding, just on the bed, not in the bed. 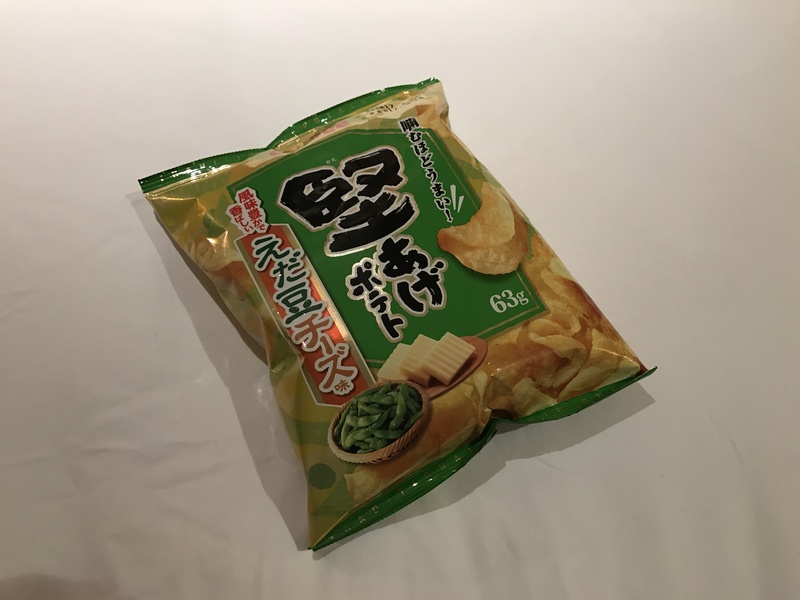 The chips had a really light flavour that was mostly cheese and just a hint of sweetness mid-chew that I’m presuming is meant to be the edamame. It wasn’t amazing but I loved the bite to it. I’m not entirely sure what kataage means but I think it refers to the crunch of the chips? It’s so hard to pick out just one bag of chips because there are so many interesting flavours! Any recommendations are welcome. 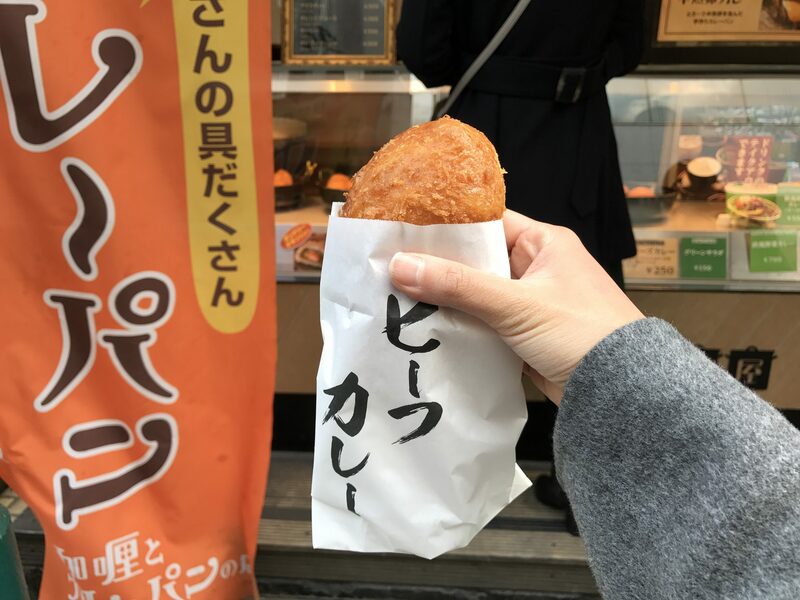 Edit: Just asked a friend and apparently it’s known that Calbee does baked potato goods too so ‘kataage’ is meant to distinguish it as ‘fried’ instead of baked. I think the literal translation for these are Southern Crackers? Anyway these were really interesting and kind of tasty. I bought them because I saw they had peanuts and black sesame on them and for the word ‘senbei’ which I generally associate with rice crackers. It was only after I bit into it that I realised it was wheat-based and a bit more like a light cookie than a cracker. I liked how salty it was and each cracker had lots of peanuts, reminding me of this other cracker that we have available during Chinese New Year in Malaysia. 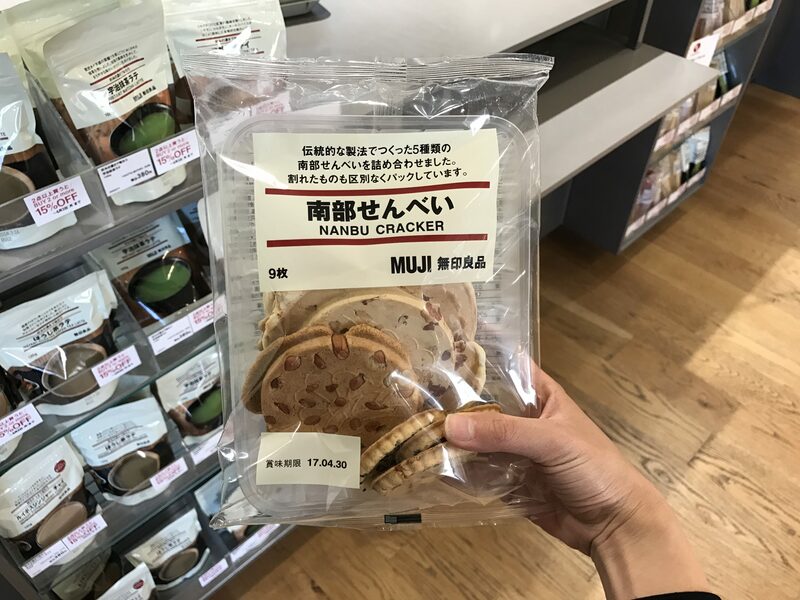 There’s another kind of deep fried cracker that Muji sells which is my usual go to but the store I went to in Shimokitazawa didn’t stock it. You can get this in many places but I was in Shimokitazawa when I finally felt tempted to get it. These are curry breads or donuts, considering they are crumbed and deep fried. Temmaya has a variety of curry fillings such as normal curry, beef curry, curry with cheese and chicken curry (it has a stick of chicken katsu down the middle). I was afraid it would be too oily but this one that I had wasn’t, not that I’m trying to justify it! The curry was nice but it would have been nicer if it had more beef filling. It’s my first time having カレーパン , no doubt there are better places to get them. I’d recommend it if you can get it somewhere where it’s made fresh and also only if you like Japanese curry as it’s quite different to other curries that you might be used to. Looking at the price makes me think I made a mistake recording it because that seems pretty expensive for sweet potato. 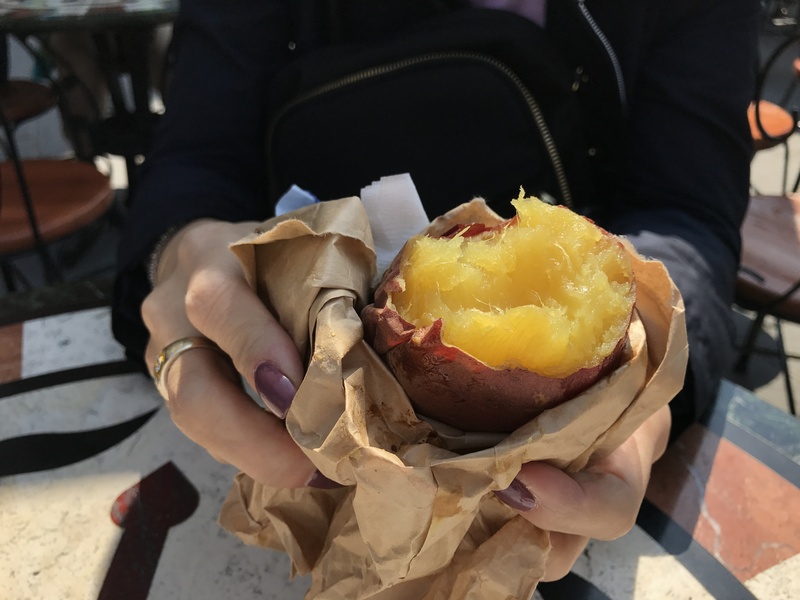 It’s just straight up sweet potato so I don’t think I need to describe it too much, but just know that it is a snack you can get in Japan in quite a few places. I had this once when I was in Nara as well. I don’t generally like sweet potato unless it’s fries but this was nice to have on a relatively cold day. This one was really, really sweet though which makes me wonder if it was steamed with some kind of syrup or if that’s just Japanese selective breeding for you.